A family weekend, dedicated to medicine and health promises to be just what the Doctor ordered, as the first day of Dundee Science Festival injects some fun and fascination into the city! From testing the effectiveness of sunscreen and discovering some ‘medical marvels’, to exploring the history of surgery against more futuristic medical technologies, ‘Medicine and Health Weekend’ will take place at Dundee Science Centre on both Saturday 29 and Sunday 30 October 2016. A range of experts will be on hand, giving a family-friendly insight into topics such as dementia and coeliac disease. There will also be the chance for visitors to test their endurance, speed and strength with some fun, active challenges. Saturday highlights will include British Science Association (Tayside and Fife Branch) activities to inform healthy decisions, from explaining the importance of vitamins, antioxidants, fibre and minerals in the diet, to offering Body Mass Index (BMI) test. Meanwhile, the Mountain Rescue team workshops will showcase rope work and some of the electronic equipment they use, while their Land Rover is parked outside the Science Centre. Saturday afternoon will see Medical Marvels shows, giving visitors a tour of minimally invasive surgery, X-rays and ultrasounds. On Sunday, University of Dundee scientists are promising ‘Fun with Magnets’. Both days will also give children the chance to dress up in lab coats and test for coeliac disease with mock lab tests and explore their endurance, strength and agility by seeing how high they can jump! Alzheimer’s Society will also be challenging visitors to test their reaction times with the Batak machine, and the powerful rays of the sun will be under the spotlight with a UV Camera demonstration where people can see how well sunscreen works. The event will run on both Saturday 29 and Sunday 30 October, from 10am until 5pm. Normal admission applies. Members and under 4s free of charge. ‘Medicine and Health Weekend’ is one of three themed weekends being held at Dundee Science Centre during Dundee Science Festival, with ‘Animals and the Environment Weekend’ on Saturday 5 and Sunday 6 November, and ‘Gaming and Digital Technology Weekend’ on Saturday 12 and Sunday 13 November, the final weekend of the festival. Now in its seventh year, the science celebration will descend upon the city from Saturday 29 October through to Sunday 13 November 2016, promising fun, entertainment, inspiration and curiosity for all ages in the shape of 30 events. 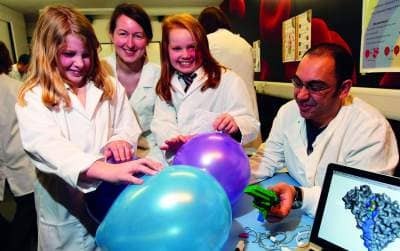 Dundee Science Festival is brought to you by Dundee Science Centre, along with key partners Dundee City Council and The Scottish Government.